With the final tests and the Mission Flight Acceptance Review successfully concluded, Gaia is now ready for launch and has been assigned a launch window from 17 November to 5 December 2013. 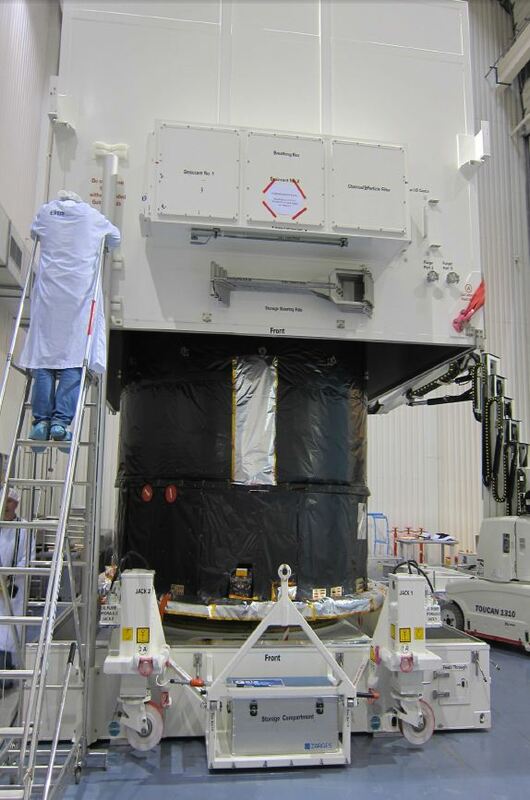 Meanwhile Gaia has been ‘switched off’ and packed, and will be shipped to Kourou in the second half of August in order to prepare for its launch. Ready to go at last! The Gaia spacecraft is seen here at the Astrium premises, being packed in its high-tech case in preparation for shipping to Kourou. The spacecraft will leave Toulouse on 22 August at 20:00, landing in the early morning of 23 August at Cayenne. The deployable sunshield together with its umbrella-like mechanism will be dispatched in a separate shipment on 28 August. Both transports will be flown by an Antonov 124 – one of the largest aircraft in the world. The ‘early team’ will leave a couple of days ahead of the first Antonov and will welcome the spacecraft in Cayenne, taking care of the initial phases of the launch campaign, including transport by road from the airport to the clean rooms of the launch site, unpacking and initial inspections. Ared, Joe and David will be in the early team, and Giuseppe will fly with the spacecraft on the first Antonov. He will tell us afterwards if it is more comfortable than the regular Air France.